POWERLINK supports two types of redundancy: medium redundancy and master redundancy. Classic ring redundancy is a simple and economical option in machine manufacturing. Applications are connected in the form of a ring, with both outer ends of the data line running through the network connected to the controller. For this layout, an extra data cable suffices to convert a daisy chain of applications into a ring, provided that the controller has two interfaces that support redundant operation. 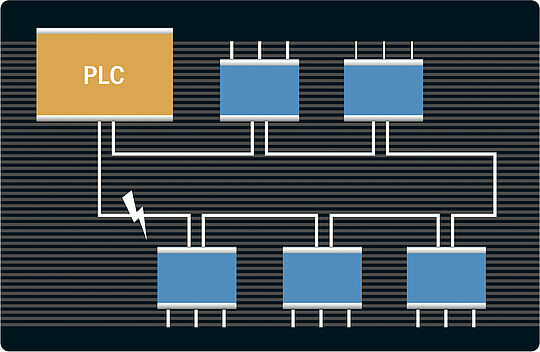 When a line failure is detected, the system switches from the failed data line to the redundant data line within a single cycle. This type of redundancy is typically used for solutions involving a considerable amount of mechanical stress. Critical systems require high-availability features, including complete medium redundancy. With POWERLINK, complete medium redundancy is achieved through the use of two different physical networks. The same redundant information is then transferred on both networks at the same time. In the event of network failure, the switchover is instantaneous and does not require downtime or reconfiguration. 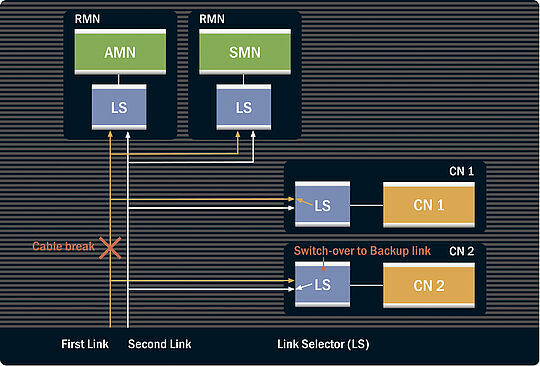 Each node is linked to both physical networks via a link selector (LS). The second type of redundancy is full master (or managing node) redundancy, which plays a key role in high-availability systems and is used for energy systems in the process industry. Master redundancy is based on two or more redundant managing nodes at the top of the network hierarchy. Only one of these nodes serves as an active managing node; the others remains on hot standby and act as controlled nodes from the active managing node's point of view. The only difference between a standby MN and a CN is that a standby MN continuously monitors all network and CN functions so that it can assume the function of the active MN at any time without rebooting. In an emergency, POWERLINK Node ID 240 – reserved by the MN – is transferred to the closest redundant MN on the fly. This type of redundancy allows for a wide range of topologies. In each case, all basic POWERLINK characteristics such as minimal reaction times, real-time synchronization, high bandwidth and simple diagnostics continue to be fully available.